MeteorTech Premises is the third level in the Heroes story of Sonic Riders: Zero Gravity. 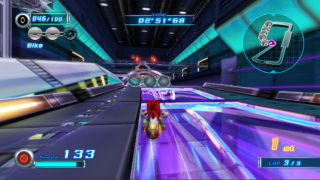 Deep inside the corporate armory of Meteor Tech, Sonic and pals race through a high-tech, electric-purple factory course. Giant cogwheel gears and automated metal pressers are just some of the obstacles to evade. A Gravity Drive section near the end of the lap allows racers to obliterate rank after rank of dormant combat robots, zipping along the sides of floating cargo crates as mechanical shrapnel flies everywhere. The level has a number of right-angle turns, which need careful gravity control to swerve round successfully. Sonic and his pals infiltrate MeteorTech and run unexpectedly into a few familiar faces. An old rivalry is about to be sparked anew! Amy's testimony in Botanical Kingdom has convinced Team Sonic that the key to the robot's rampage must lie somewhere within MeteorTech. For once adopting a subtle approach, the heroes sneak into the facility without explosions and broken doors. However, their subtle efforts are wrecked when alarms start to blare through the facility; the Babylon Rogues are intruding on corporate property at the same time, and being significantly louder about it. After winning as Knuckles, a cutscene shows - surprise surprise - Dr. Robotnik tinkering away in his control room at the core of the company. The Eggman's frustrated computing is interrupted by the arrival of the heroes in his sanctum; a whole lot of threatening later, the scientist is induced to divulge everything he knows about the robot rampage. Turns out it's not entirely Eggman's fault this time; the Mother Computer is defying his commands, and SCR-HD is controlling his SCR-GP brethren to hunt down the Arks of the Cosmos. Speaking of the Arks, Jet remembers the whole reason he was there in the first place; to swipe the artifact back off Amy. However, the pink hedgehog isn't with them, and neither is Storm. Eggman quickly patches them into a satellite feed, which shows both missing riders being pursued by SCR-HD in Aquatic Capital.